Each unique. Natural stone and crystals in an everyday item. What better way to dress up your bar and hor d'ouevres and charcuterie? Great registry item for that stock the bar party! Perfect little hostess gift for that wine lover. 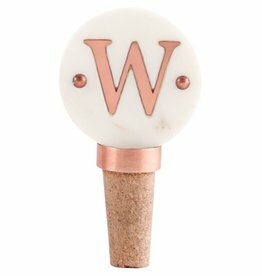 Marble w/ copper initial inset. Cork stopper. Perfect little hostess gift for that wine lover. Marble with copper initial inset. Cork stopper. Each unique. Natural stone and crystals in an everyday item. What better way to dress up your bar and hor d'ouevres and charcuterie? Unique wedding registry item for that stock the bar party! No growling allowed! 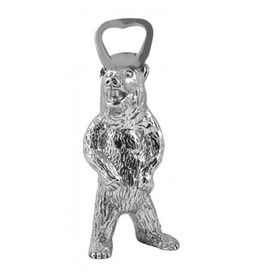 A booming bear forms the handle of the Bear Bottle Opener. 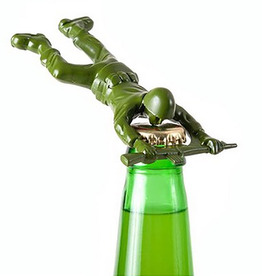 Pop open a refreshing craft beer with this bottle opener that is equal parts whimsy and function. The Cork Pops I is the fastest and easiest way to open a bottle of wine. Bicycle Bottle Stopper for your wine loving cycling enthusiast. Stock the Bar Party must-have! The Old Fashioned Wooden Muddler in cotton gift pouch. What a catch! Our Marlin Bottle Opener is the ideal bar accessory for your beach house, boat or back deck. Jump in! Our Dolphin Bottle Opener is an eco-friendly way to open your favorite brew. Perfect for the the boat or the home bar. Warmly welcome your guests to another drink, with our Pineapple Bottle Stopper, a magical symbol of hospitality. Created by hand sand casting from recycled aluminum. Hand wash with mild detergent to retain no-polish finish. These new laser cut cork coasters are here! They are sure to make you and your house guests laugh out loud! They also make a great hostess gift. These coasters are 100% cork, and are laser cut in Ellembee's Wixom, MI warehouse. The coasters are 4" x 4"
Ah the memories! Opens every bottle with dedication and strength. Cute gift for groomsmen! Each unique. Natural stone and crystals in an everyday item. What better way to dress up your bar and hor d'ouevres and charcuterie? Perfect registry item for wine and cheese and craft beer lovers. Add glam to your coffee table or table top decor with this set of four marble coasters, featuring a teaxtured raw edge with silver foil finish. These coasters arrive stacked and tied with twine, also perfect for easy gifting. All the tools for making the perfect cocktail are here--a stirrer, a shovel, a strainer, and a double-sided jigger. The handle of each piece is crafted in beautiful acacia wood. Our crystal clear Hanover Wine Coaster sparkles beautifully on your table, with or without wine. A pool of shimmering glass. This hand-crafted wine coster is the perfect item to compete a gift of your favorite wine.